Add some fun to the party with our Tomato-Basil Italian Cheese Dip. 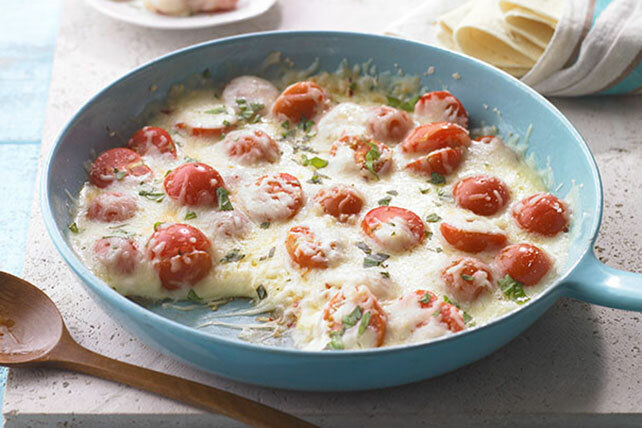 Cherry tomatoes, garlic and basil make for big flavor in this Italian cheese dip. Heat dressing in large skillet on medium heat. Add tomatoes, onions, garlic and crushed pepper; cook and stir 8 to 10 min. or until heated through. Top with cheese; cover. Cook 5 min. or until cheese is melted. Sprinkle with basil. Serve with tortillas. For easy cleanup, serve this tasty dip right from the skillet. Substitute 2 regular tomatoes, coarsely chopped, for the cherry tomatoes.